2.2 How I think about earning money using event script website. 3 Happy New Year 2019 Wishing Script HTML VS PHP Which One is Better? On Blogger Click On Create New Blog. Choose any name for a blog. After Click on Revert to classic themes. Find an Html Code box and delete all HTML code. Then Go To Download File And UnZip New Year 2019 wishing script.rar. Open New Year 2019 wishing script.html File on Notepad++. Select All Text And Paste On Revert To Classic Themes Box. And Select Nav bar To OFF. Final Step Click on Save Button To Save Theme. Firstly You need a domain You can buy anywhere you want. Then buy hosting from https://shivanshhost.com because shivanshhost.com is providing you event script plan at ₹ 25/month. You got a zip file of Happy New Year 2019 WhatsApp Facebook Viral PHP Wishing Script. For Upload file on Website Go to C-Panel and go to file manager and select upload button. Then simply drag the Happy New Year 2019 WhatsApp Facebook Viral PHP Wishing Script .zip File and drop to upload it. Then the script is filly Installed. GOOD LUCK WE ARE GONE TO EARN MONEY FROM Happy New Year 2019 WhatsApp Facebook Viral Wishing Script. Wishing Script is only for earn money this called Event Blogging, This is the first post about WhatsApp sharing the viral script. I hope you enjoy earning using this free happy new year WhatsApp viral script. If you need a more viral script for free save this website on a bookmark and get latest PHP and HTML free WhatsApp viral script and earn money. How I think about earning money using event script website. Hey, this is Shivansh from Technical Tricks YouTube channel and in this post, I will tell you about how we can earn money from script website. I work on a script website recently 3 years and I also and 1,00,000 plus rupees in one event so I think this is a wonderful chance to earn money if you are a student then event script website is helping to increase your pocket money because we do not totally depend on our Guardians then we think we try to make a website a simple website not using any coding language not need to learn PHP HTML or any other language just follow the post or was a video watch the video, I uploaded on my YouTube channel and don’t think you are successful because success is never waiting for you so please take a chance and after all you get a success in event script basically event script successful depends on your event script design if you want a better-looking event script design then you don’t download any other website event script website because most of the people using same script and person is already shared like this website on WhatsApp so why ? he share again your website then if you want a lot of money then downloading event script from other website and customize according to you or something good looking then you can get successful event script blogger I don’t know why I am writing this post but I think this post helps you grow your earning if you want to earn more money from event script you can try to hosting website to host your script because don’t use hosting google Adsense is cut off your revenue from your total earning so I do not recommend to you use the blogger for event blogging or event script blogging because blogger is not looking good and not doing you cannot make a beautiful even script website. You just make a simple website and not people like the simple website and people want to share which website with people name because if people do not get our name then people do not share to other people. Happy New Year 2019 Wishing Script HTML VS PHP Which One is Better? 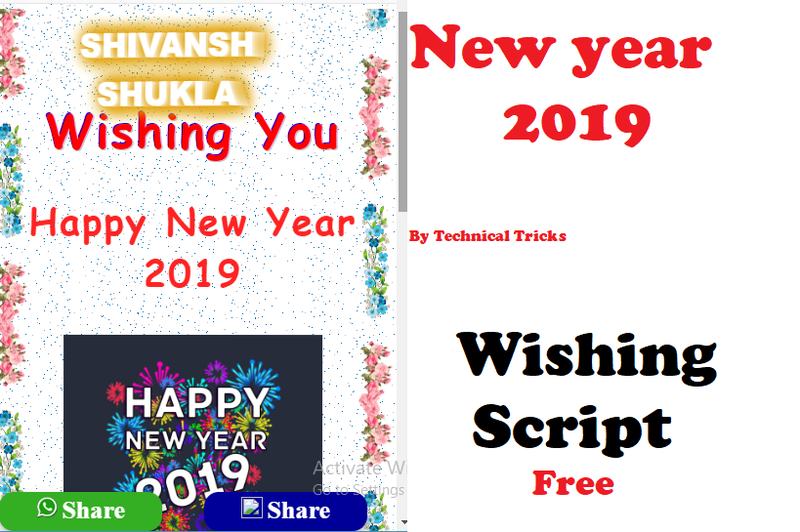 What are you think about “(HTML+PHP) Happy New Year 2019 WhatsApp Facebook Viral Wishing Script Free Download”. Please Comment and tell us your opinion. Technical mix Gyan is a YouTube channel and also a blog which provides lots of event script in PHP or HTML If you need help visit here.